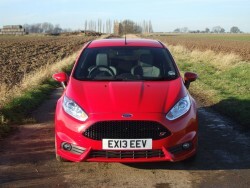 Until we drove the Mountune version, we didn't know the Fiesta ST needed more power! Good points: steering, brakes, engine, seamless integration of extra power, suspension, handling, looks, noise, performance... need we go on? 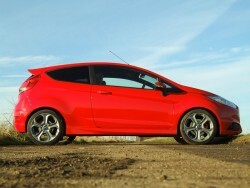 Let's open with the obvious - the standard Fiesta ST is near perfect when it comes to hot hatches. And as an example of simplicity that is supremely well-executed, there's nothing we can think of in recent years that can hold a candle to it. So does adding 35hp and 30Nm to the front-wheel drive mix actually improve the tiny tearaway, or turn it into an overpowered mess? Inside and out, there is precious little to mark the Mountune model out as something special. 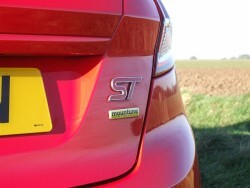 This is because the £599 tuning kit (it can be fitted to any ST in less than an hour at Mountune-approved Ford dealers and it preserves the manufacturer's warranty) adds nothing to the car apart from under the bonnet, with the only visual giveaway a minuscule yellow Mountune badge on the car's rump. 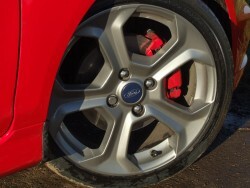 This is no bad thing, though, as we happen to think the ST looks fantastic as it is, especially on those alloy wheels and in vivid Race Red. You could make an argument to say the pre-facelift B299 Fiesta had a prettier face than the current one's gaping trapezoid grille, but the ST is hardly ugly, plus it has a fantastic stance from side and rear three-quarter views. The whole ST ethos shines through as you sit in the excellent front Recaro seat and adjust the driving position right down to the floor. The spot-on steering wheel and ergonomically-sweet gear lever are ideally placed, while the lack of needless fripperies such as climate control, auto headlights/wipers and adjustable drive setting buttons tells you all you need to know. 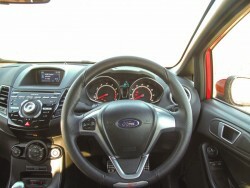 Aside from the company's one concession to modern tech - its SYNC infotainment system with USB and Bluetooth connectivity - Ford has given you the bare basic tools to get on with the job of driving; it's like the company believes anything else would be overkill, and we admire the ST all the more as a result. 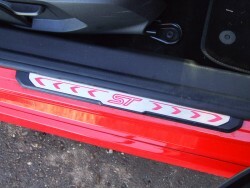 The exact blurb for what you get as a Mountune customer is 'a re-modelled airbox base with secondary inlet duct, a high-flow filter element and unique calibration [of the ECU]'. In English, what this means is power is lifted to 215hp and peak torque to 320Nm from 180hp and 290Nm respectively, although it should be remembered these figures are delivered during a 'time-limited overboost' stage. While Ford hasn't released exact data on what it does to top speed, economy and CO2, it cuts the 0-62mph sprint by 0.3- to 6.6 seconds - while 31- to 62mph in fourth tumbles from 6.4- to 5.7 seconds, which gives you an idea of where the Mountune upgrade delivers its best work. Dynamically, though, the car is unchanged, and the best news is that the Mountune kit does not introduce any unruly behaviour - such as torque steer - into the package. The car already felt brilliant after my first few tentative miles with it, but the epiphany came on a miserable wet night on roads I know very well, littered with slippery leaves and agricultural deposits. With its Torque Vectoring Control system, the Mountune ST found monster levels of traction no matter what its 17-inch rubber was encountering. That, coupled with the complete lack of body roll, a lively rear end and the extra Mountune punch, make this car devastating across country. The brakes and gearshift are both delightful, while the steering should be held up as a shining example of how to execute an electro-mechanical system; it is faultless, without an ounce of slop or vagueness, beautiful weighting and it's super direct. So composed did the car feel that I turned off the traction control despite the conditions... and still it excelled, fizzing out of bends, tightening its line without drama where required, and ultimately delivering a seminal journey during which I could not remove the massive smile from my face. It was exceptional. Back in the real world, the ride is probably the only area where the grumpier of passengers would not cut the car any slack. While it's not harsh, it has that odd, bouncy-bouncy, stiff-dampers modulation that means motorway cruises are hardly serene. Conversely, the extra mid-range muscle the Mountune kit endows the ST with means it is better at utilising smaller gaps in traffic than the standard car, making that side of motorway drudgery more pleasurable. You won't find yourself shuffling gears to pull out from behind a HGV on dual carriageways, that's for sure. But I digress - as the driver, you quickly forgive the ride because of the car's exemplary body control. The net outcome of all this is that we're left with a car to which, if we could do it, we would award 5.5 stars out of five. We wouldn't blame you for sticking with the 180hp version of the ST, as it's sensational as it is, but this sublime, excellent value Mountune package is really a no-brainer if you're buying an ST for all the right reasons - namely, that you're a keen driver and you want the best hot hatch there is. It adds just that tiny bit more grunt in the mid-range, improves on the hot Fiesta's keenness to rev out to the redline and even makes a turbocharged four-cylinder sound properly entertaining, particularly from 4,000rpm onwards. 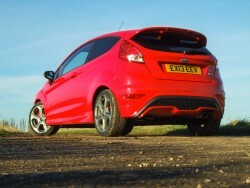 The Fiesta ST Mountune is, for us, as close to motoring perfection as anything we've encountered. It delivers on its core design brief in every single area and offers up a driving experience of true brilliance. One of the best performance cars of any size, price or power we've sampled, it renders all the competition as also-rans. You simply must drive one of these in your lifetime; trust us - you'll not regret it. Clio Renaultsport 200 Turbo: forced induction gives hot Clio the torque it lacked, but has robbed it of soul. 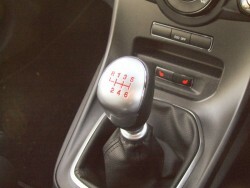 Daft dual-clutch gearbox further weakens the costlier Renault's case. Peugeot 208 GTi: much improved over the dross we've had post-205 GTi, but it costs £36 more, is slower and has less exciting dynamics than a Mountune-equipped Fiesta ST-2. Volkswagen Golf GTI: as remorselessly accomplished as ever, you need to shell out over £25,000 for one and it'll never entertain you as much as the Fiesta. Strong residuals are its biggest strength.